Through the College of Medicine Aboriginal Admissions Program, people of Indigenous (Métis, Inuit and First Nations) ancestry can apply for admission to the Medical Doctor (MD) program of study. The program is designed to support growth in the number of Aboriginal people becoming doctors in Saskatchewan. Ten percent of the positions available in the MD degree program each year are specifically for applicants of Aboriginal ancestry. The program is open to all residents of Canada, with preference given to residents of Saskatchewan, the Yukon, Nunavut and the Northwest Territories. (Residency is defined more specifically on the College of Medicine admissions website). To be considered in the Aboriginal Admissions Program category, indicate on the application form that your ancestry is Aboriginal (proof of ancestry is required). Aboriginal applicants are required to meet the minimum standards for admission, as described in this brochure. 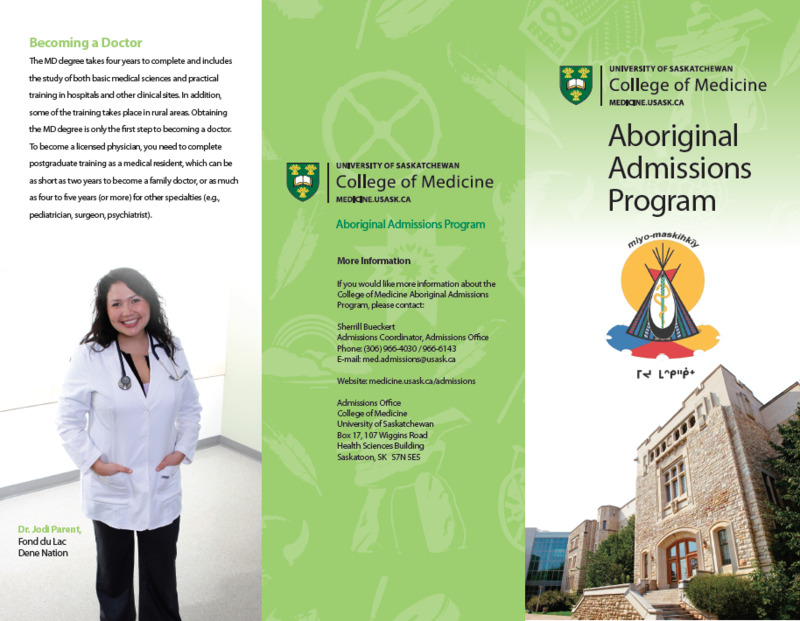 Through the College of Medicine Aboriginal Admissions Program, people of Indigenous (Metis, Inuit and First Nations) ancestry can apply for admission to the Medical Doctor (MD) program of study. The program is designed to support growth in the number of Aboriginal people becoming doctors in Saskatchewan. Ten percent of the positions available in the MD degree program each year are specifically for applicants of Indigenous ancestry. Join staff, faculty and student role models for a day of programming, networking and information about the Indigenous Admissions Program at the University of Saskatchewan. The day will include: Knowledge Keepers, MMI Process and Practice Sessions, MCAT overview and information session, Admissions information, Role Models and Social Accountability Information. Join our Pre-Health Science Group to receive information about events, workshops and scholarships. The College of Medicine at the U of S participates in and offers Indigenous high school students health careers exploration opportunities. Some of these career exploration opportunities include Indigenous Spend a Day, the Northern Lights Health Career Symposium and local events, such as U of S Open House, The Future is Yours Career Fair, and many other career fairs. These various events provide a variety of hands-on, interactive learning opportunities from various health professions, such as reading an x-ray, tours of the Simulated Clinical Care Area of the Clinical Learning Resource Centre (CLRC), traditional medicine lectures, and laparoscopic surgery demonstrations, and other activities. The career fairs also provide opportunities for students to hear stories of inspiration from Indigenous medical role models. This unique elective places you in an interdisciplinary team of health care providers and engages you in patient-centered care in a rural community. All Nations Healing Hospital also has a holistic healing center dedicated to residential school outcomes, addictions, abuse, family counseling, and crisis interventions. These awards are open to students of Indigenous ancestry who are continuing students (beyond first year of a program) registered in a minimum of 24 credit units (September-April) working towards a Baccalaureate degree in a bona fide four-year baccalaureate degree program at an accredited Saskatchewan post-secondary institution, as determined by the College of Medicine Admissions Office and the Award Committee. All University of Saskatchewan student awards can be found on the main 'Awards' page.